What fun I had today, going through my images of containers from the past. Every year is an adventure in creative experiments. 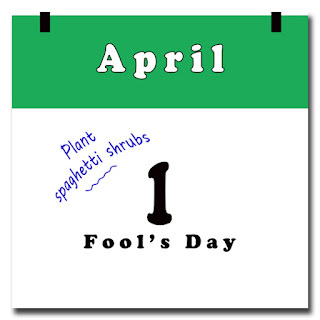 Today’s walk down memory lane helped me remember my triumphs and disasters in container growing. Often the most memorable containers come from the simplest plantings. 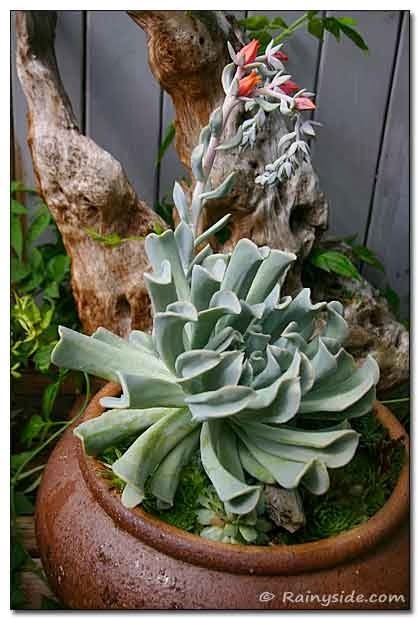 Coming across this image photographed in 2007, it made me realize I needed to grow Echevaria ‘Topsy Turvey’ again. I grew it for several years and for some unknown reason I discarded it. I love the inside-out look to its succulent leaves. 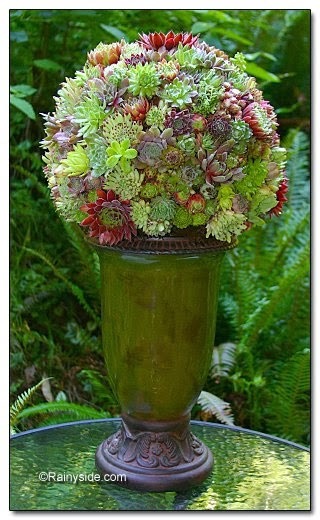 Here it is on my deck, growing in a shallow rustic, brown pot with hens and chicks (Sempervivums) at its feet. This large container I use as a year round water feature. It housed many different plants, from water lilies to cannas and everything in between. One of my early configurations in this container included items I had on hand. It made for a fun pot when it sat on my deck. 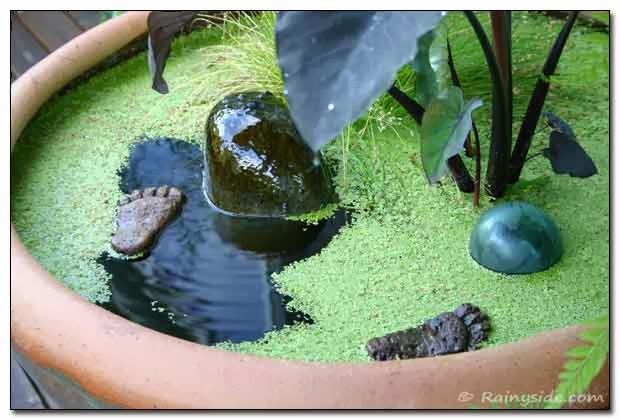 The rock bubbled liquid that parted the fairy moss (Azolla) enough to see the water. One of three plants in the container, it floats around the dark stems of elephant ear (Colocasia esculenta 'Black Magic') and Isolepis cernua the fiber optics grass. A glass float drifts around whenever the wind blows. The best part was the carved pumice—two feet walking on water. I came across this image of a shell pot I used last decade for Begoniax tuberhybrida. The pot has since melted from frost damage after leaving it out too many winters, but I appreciate the images I have of it from 2008. Before planting the container and propping it up against the rock wall in the shade of a plum tree, I drilled another hole for drainage. In the garden where textures and foliage colors are the rule, Saxifraga ‘London’s Pride’ grows on the wall to the left, and Sedum spathulifolium looks like a river running down the wall to the right. Both comingle with Ajuga ‘Black Scallop’ at the bottom. 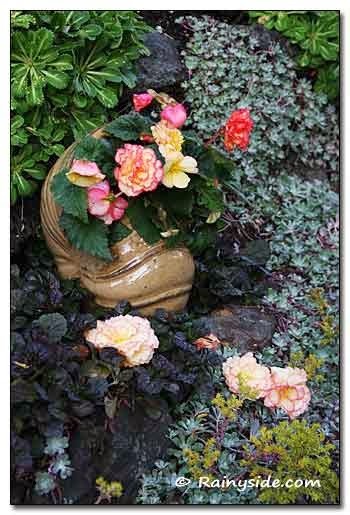 The Begonia in the pot brought a bit of pizazz and livened up this shady corner of the garden. Since I am launching our new blog for Rainy Side Gardeners on Black Friday—the infamous shopping day after Thanksgiving—I am going to share with you some gardener-friendly gift ideas for the holidays! I don’t know about you, but I try to stay clear of the Christmas shopping madhouse and buy locally from artists and artisan and small businesses. Shopping online helps too, but I want to be sure that I support the artistic talents or entrepreneurial spirits of those who live around me. 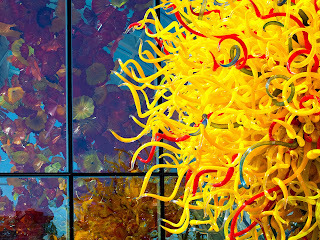 Two extra special gifts that I received last year from my daughter were tickets to the Chihuly Garden and Glass in Seattle. The other gift was a Discover Pass to Washington State Parks from a friend. Both bring benefits to my community and state, which makes them extra special. I thought about some gift ideas for gardeners, some I’ve talked about before in articles, and I don’t mind rehashing them again as they make fine gifts. First on today’s list of gift ideas is a membership in a local plant society or club for someone who loves to share with like-minded gardeners. There’s a society for almost every kind of plant genera out there. Many have local chapters. If your spouse loves fuchsias, a year membership in a Fuchsia Society would be welcome! A search for garden clubs and societies should let you know which ones are available in your area. Here's a compiled list of Northwest Garden Societies. As I am about to be writing for a regional home and garden magazine after the first of the year, I thought about subscriptions to localized print media. Subscription gifts are a boon to the local print Medias, as well as to those who receive the gift. I picked up the Edible Seattle magazine the other day and thought what a perfect gift this would be for a vegetable gardener. 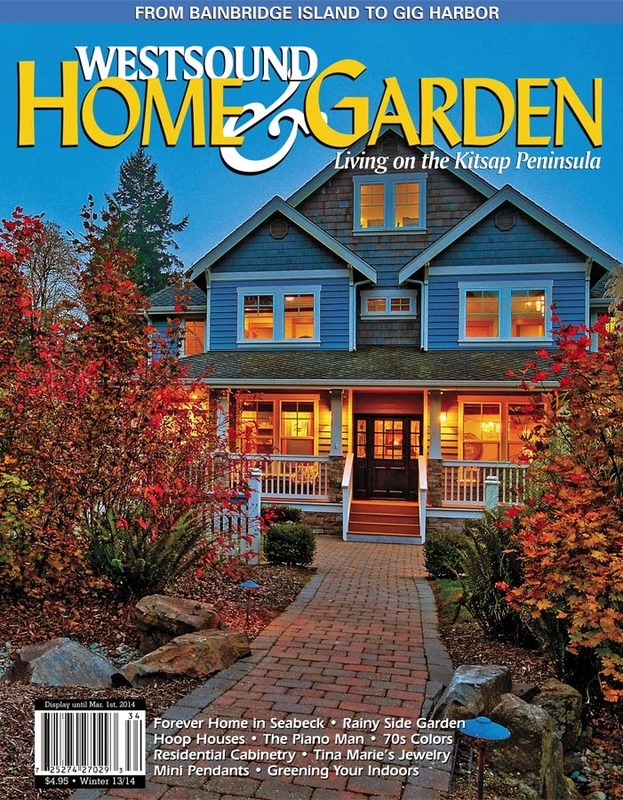 Alternatively, the magazine I will be writing for regularly— West Sound Home and Garden, in which I am proud to be contributing to such a beautifully crafted, high quality magazine. 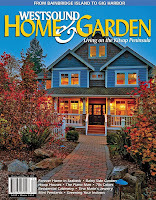 National magazines such as FineGardening, Horticulture, Gardens West (BC), or Organic Gardening also make fine gifts. Whenever I give a magazine subscription, I buy one from the newsstand to wrap, pull out a subscription card, and send it with the person’s name and address filled out for them. 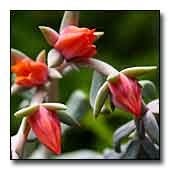 Of course, gift certificates to nurseries are gifts that the gardener in your life can use when spring fever hits and they are itching to get out and plant. A few plant dollars in the pocket, some shiny new handcrafted tools, and garden gloves would certainly make my day! What I love about shopping USA homegrown companies is, when I buy from them, I help our economy—a gift that keeps on giving. Even after Christmas, be sure to check out some of the places that keep the dollar home. 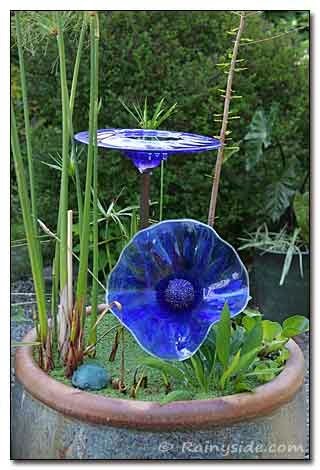 I adore this water feature, two cobalt blue, hand-blown glass by Barbara Sanderson.She also has exquisite art that dress up the garden beautifully. You can order pieces online or give a gift certificate. Some of these pieces are beautiful art for the home. The sales are hitting my e-mail inbox. 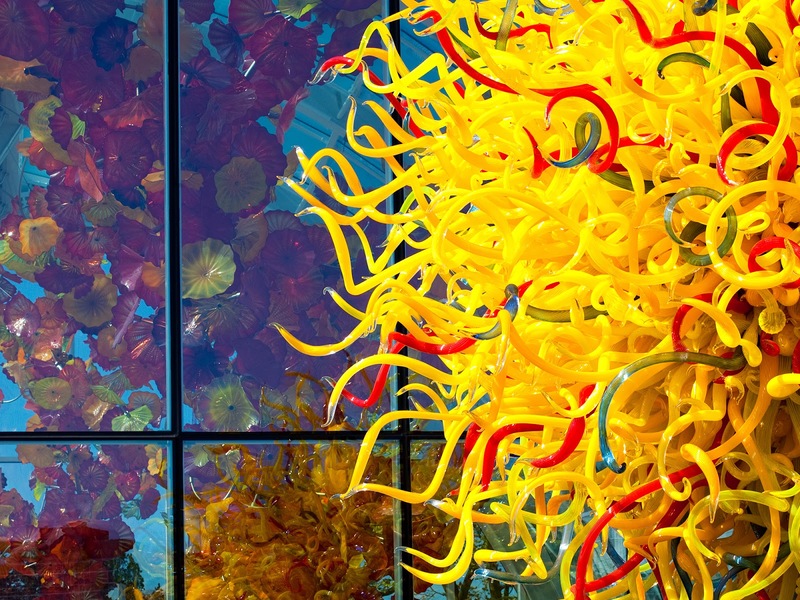 First, a 24-hour ticket discount for the Northwest Flower and Garden Show in Seattle. On Cyber Monday, December 2, 2013, you can buy tickets online and pay only 12 dollars. The day of the show, ticket price is 22 dollars. I wrote it up in this article where you can get the code for the sale. Botanical Interests (one of my favorite seed companies) has a 20% off sale on through December 2. This holiday weekend is geared for shopping. One thing great about ordering through cyberspace is you don’t have to be stepped on, poked, elbowed, or shoved to get the good deals. If you have a subscription to their newsletter, you probably received notice for their 20% off sale during Black Friday, November 29 until Cyber Monday, December 2, 2013. 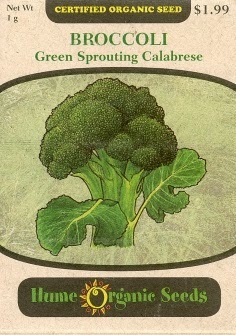 Gift Certificates for the vegetable and flower grower are an ideal gift too if you missed the sale! Womanswork is a company owned and operated by women. Although not all their products are made in the USA, here is their list of products that are! I’ve been trialing one of their gloves for a review and so far so great! I will be writing up my favorable review in time for the garden season, I want to see how they hold up during the colder months of gardening. 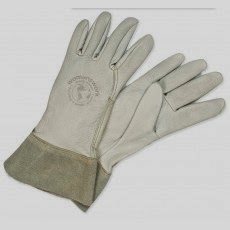 In the meantime, check out their gloves, they are amazing! Renee’s Garden has everything from gift certificates, and a fabulous offering of heirloom seeds and a few great cookbooks to help bring your harvest to the table. Another woman-owned company that is based in the USA. 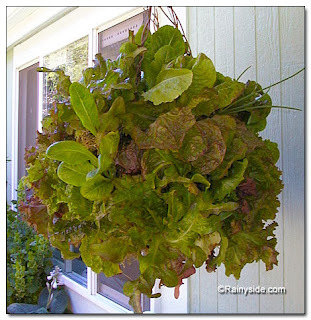 Here’s a page of wonderful holiday gift ideas, for the gardener or yourself! Nichols Garden Nursery located in the Willamette Valley in Oregon is another great nursery, offering seeds and other offerings! If you think you don’t have enough space to grow your own edibles you haven’t read Rose Marie Nichols McGee and Maggie Stuckey’s book “The Bountiful Container”, you are in for a treat! I highly recommend it for your library. Visit their page and let them help you reap what you sow! Territorial Seed Company is a place I have ordered from for over two decades. They are another Oregon based company. They have provided us with Northwest oriented advice for years and continue to offer seed that works for our unique climate. They do not offer any GMO seed, so you can buy without worry from them. Moreover, despite rumors, the Monsanto, Corporation, does not own them. If you are Northwest gardener, you know you can’t get any more Northwest based than Ed Hume’s Seeds. They report that they do not sell treated or genetically engineered seeds. Plus, some of their product is certified organic. Besides being one of our own, the best part about shopping with them is the prices are always reasonable. How about giving a gift of manure? Now before you go poo-pooing the idea, hear me out! I know a few women who loved receiving a dump truck load of composted manure for their garden. However, before you order a steaming pile of doo to be dumped onto your property, you better know your gardener well enough that you know he or she would love it. Otherwise, they may wonder what exactly is the message behind the gift! Better yet, and especially if you are not sure how well it would be received, give some gift bags of manure tea from Authentic Haven. Their soil conditioning teas are quality, organic products that will help grow healthy plants for your gardening friend or spouse. Makes a great stocking stuffer! If the gardening person in your life is crafty, and loves to make unusual plantings, print out the directions on how to make a sedum globe, bird cage planter, or a moss lettuce basket. You could make a little gift basket of the items she/he will need to make these. All these pages are very popular, even Martha Stewart showed her approval by pinning one of them to her Pinterest Board. If you have some great gift ideas or products for gardeners, please share below! I wish you happy and relaxed gift shopping days for you!